A conflict arises whenever the timetable does not meet some realistic requirement. For example, when the same person is attempted to be scheduled at two different locations simultaneously – it is considered as a conflict because that person cannot really be physically located in two places at the same time. In this chapter we will describe the various types of conflicts that are monitored by the program and what happens when they are detected. There is a variety of potential conflicts which the program monitors in order to warn you in case they are detected. 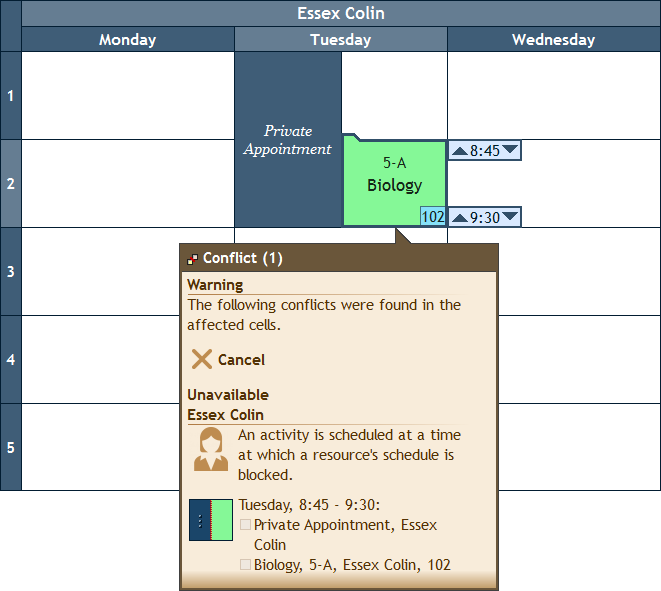 When a conflict is detected as a result of the last thing you did, a Conflicts Warning Window appears which indicates the new conflicts and asks you whether you would like to cancel your operation or ignore them and continue anyway (in which case they will be logged in the Conflicts pane - but we'll get to that later in this chapter). So first, let's go over the various conflict scenarios that the program would warn you about. 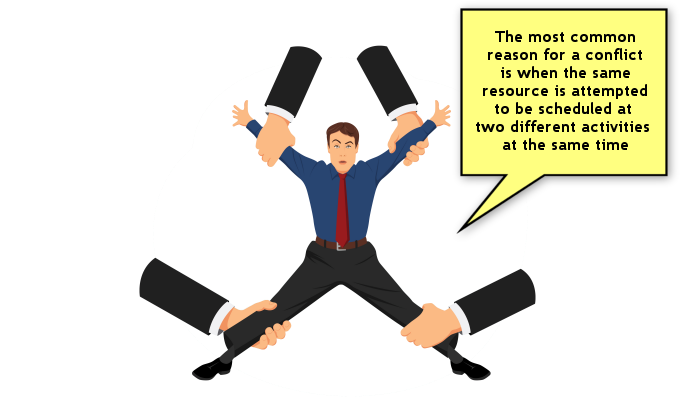 By nature, human resources cannot be double booked. 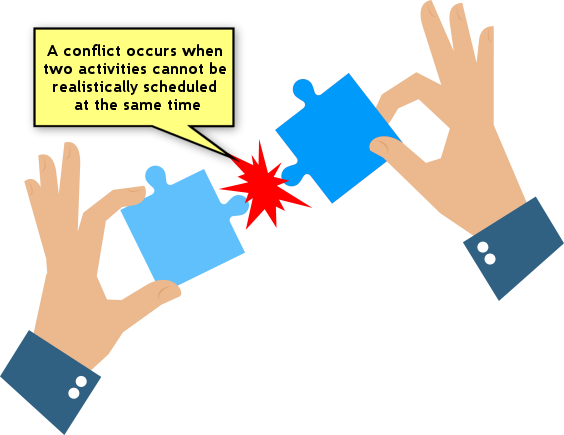 This means that if two activities which involve the same student, teacher or group of people are scheduled at the same time, the program considers it as a conflict. This is what we call the Conflicts Window. In it, each conflict has a title which contains the type of conflict and the involved resource, a description of the conflict, the relevant time range and the conflicting activities. 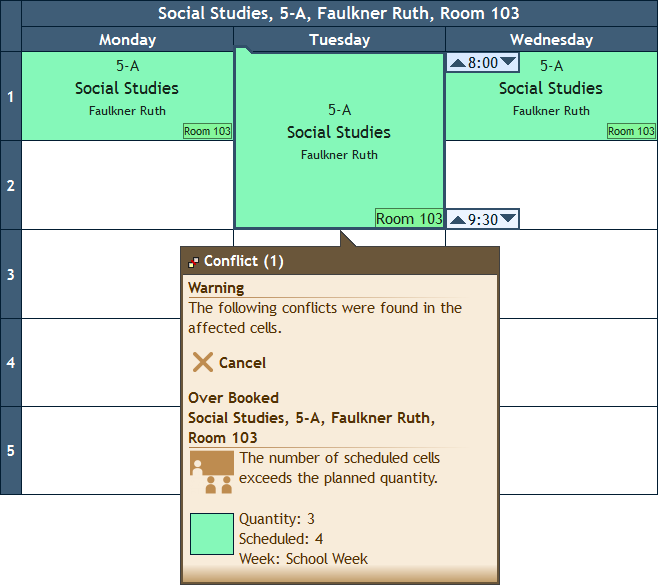 You can review the conflicts and decide whether you would like to cancel the last thing you did or continue anyway. The first is to cancel the last thing you did and go back to the state before - basically undo what you just did. The second option is to ignore the conflicts, complete the operation and perhaps settle the conflicts later at your convenience (note that you will always be able to see these conflicts in the Conflicts pane – as explained below). The third option is to settle the conflicts "on the spot" directly in the Conflicts window by choosing which conflicting activities should remain scheduled and which should be deleted. Note: When you are working online and connected to a server, if some user is facing the Conflicts window, no other user can make any changes until the first user either presses "Continue" or "Cancel" in the Conflicts window. If some other user attempts to do something, he/she will be shown a message asking to wait for the first user to finish an operation. Important: By default, the Conflicts pane displays only the conflicts of the resource which is selected in the navigation pane. 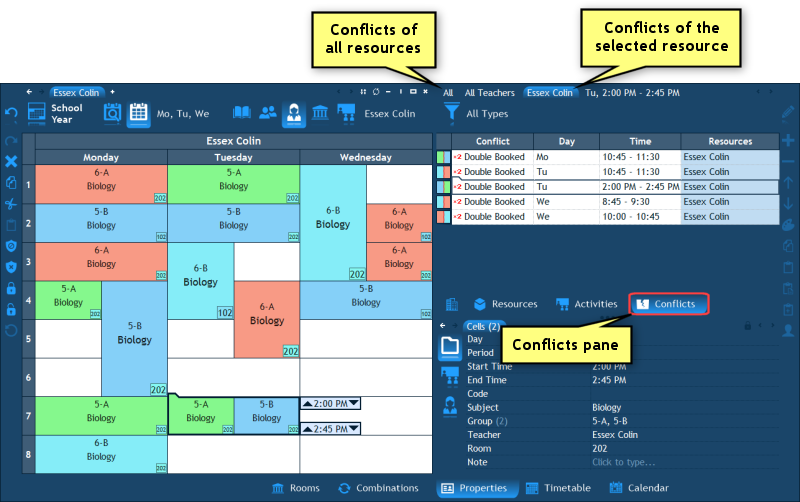 For example, if you are now viewing the timetable of a teacher in the main timetable pane, the Conflicts pane displays only the conflicts in which that teacher is involved. 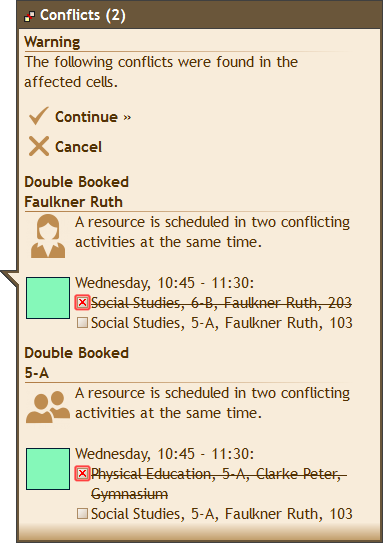 To display All resources' conflicts, click the tab named "All" at the top of the Conflicts pane. In the list of conflicts, each row represents one conflict. 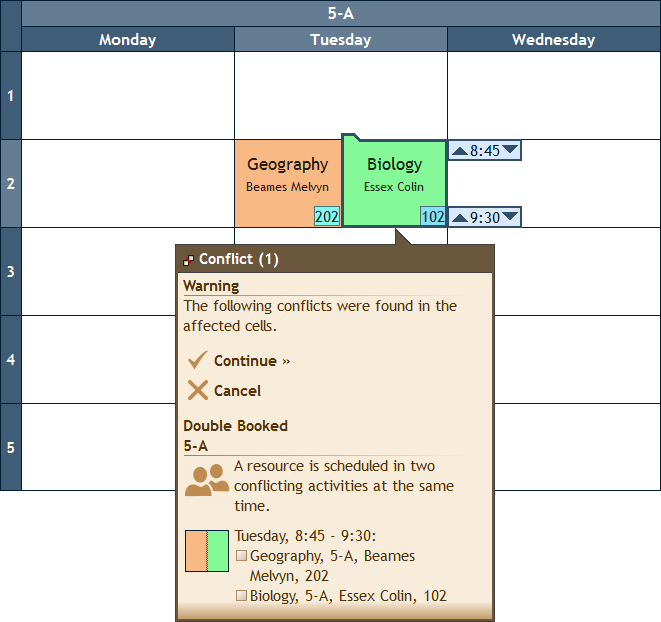 If you double click a row, the program will take you to the timetable of the resource who is involved in that conflict, and also select the relevant cell. 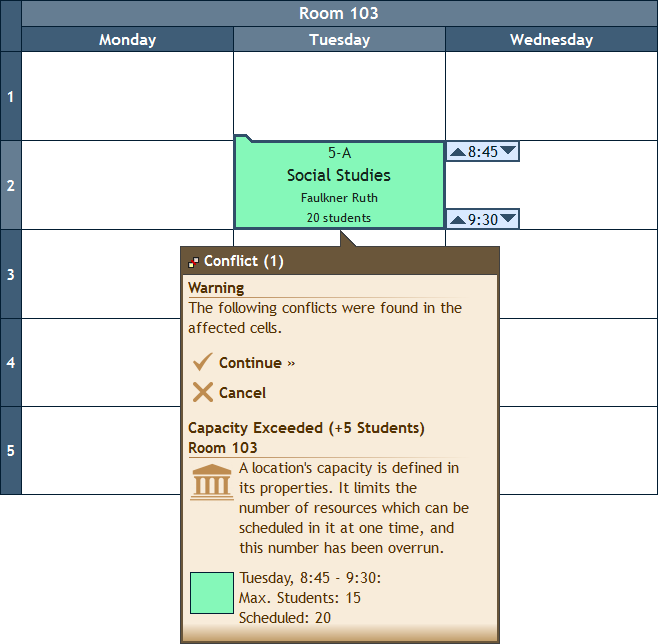 The last tab above the Conflicts pane contains the day and time which are currently selected in the main timetable pane. When you click that tab, only the conflicts of that day and time are displayed. All other conflicts are filtered out. If you are interested in seeing only the conflicts of a specific type (e.g. only double bookings), you can use the filter button above the list - the one which by default says "All Types".